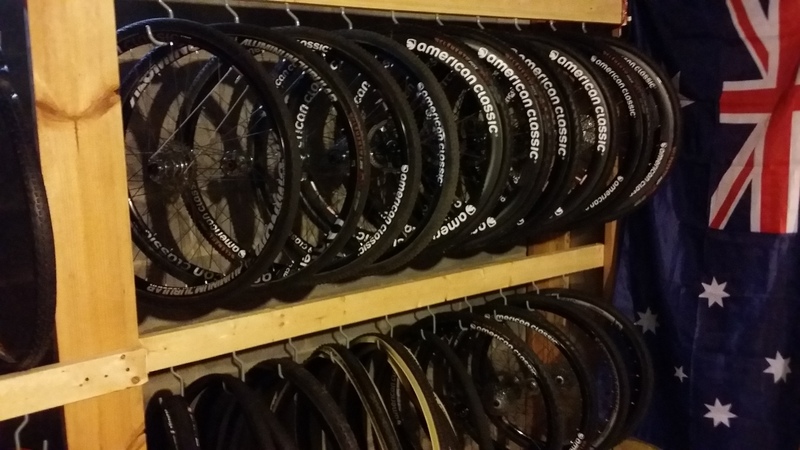 People often ask for more behind the scenes information about cyclocross races; what happens, how does support work, what goes on in the pits etc. 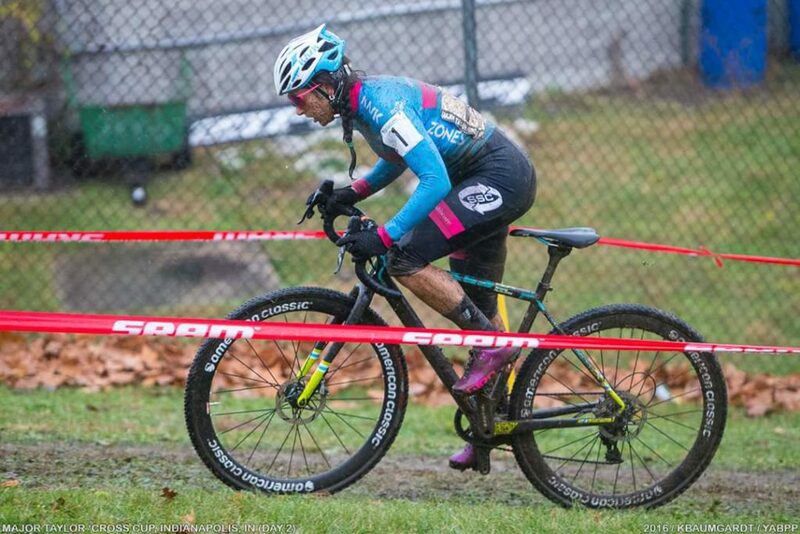 So I thought it might be an interesting thing now that the majority of racing is over and we are preparing for nationals to do some blog posts covering what I do to get Courtenay McFadden’s bikes in shape for Nationals in January. Courtenay is in a bit of a unique situation in that with our team (Women’s CX Project) supporting her on the East coast and Midwest, she is able to leave her bikes with us. 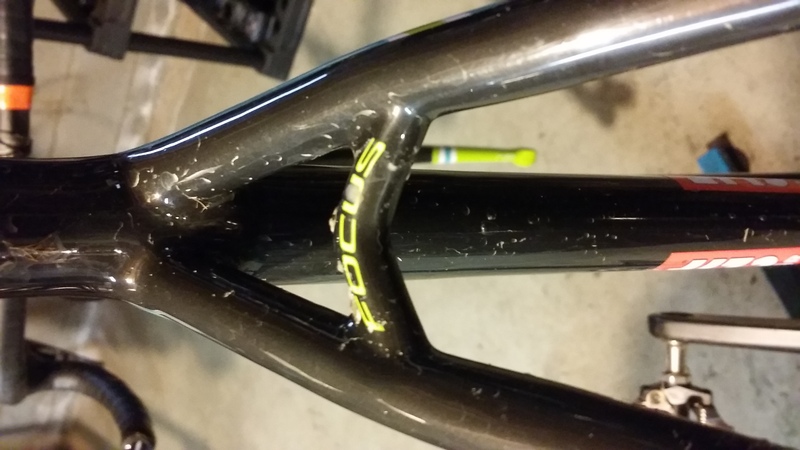 Because of her amazing sponsorship from Focus Bikes she was able to put together 4 racing bikes this year. She keeps 2 on the west coast and 2 with us here in the Midwest. This allows her to fly back and forth to races without having the extra burden and cost of flying with bikes. Sometimes she will transport some wheels or other smaller items with her but as anyone who has traveled with a pair of bikes knows it is a PAIN and something very nice to not have to do. So as a result of this pretty cool setup I keep 2 of her bikes with me pretty much at all times and am able to transport them to races in my sprinter van. With the bikes at my home shop is allows me to conveniently work on them and get them ready for upcoming races. Now typically this process has needed to turn around in a week for the next weekend race but with nationals almost a full month away it will give me an opportunity to document some of what gets done to these two bikes to get them ready. 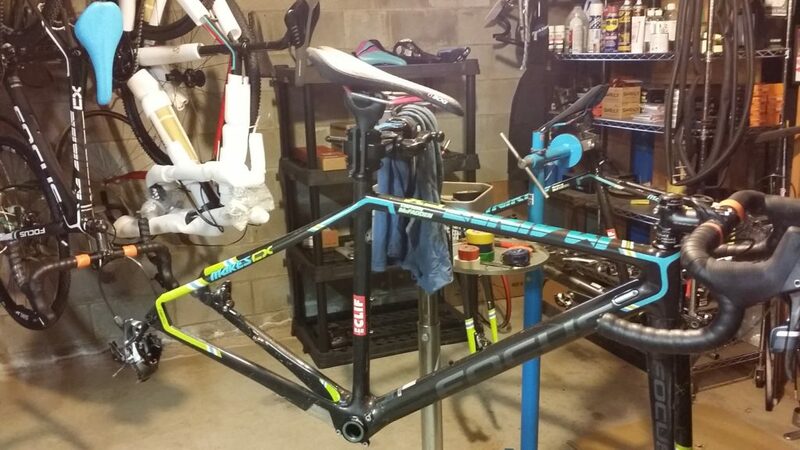 So let’s start with the current situation and state of Courtenay’s bikes post Indy C2 and we will hopefully finish off with a pair of pristine Focus Mares CX bikes that are ready to go take on Nationals in January. I will of course be posting this in several installments as the work gets done. OK let’s get going! As you may or may not know Courtenay got second and first at the two races this past weekend in Indianapolis at the Indy Cycloplex at Marian University. Home of the Major Taylor velodrome. As you can see in the pictures it was WET. It started raining around noon on Sunday and rained continually through the evening. So as you can imagine by race time at 3:00 Pm everything was completely soaked. During Pre Ride, about 35-40 minutes before her race started and she was about to get on the trainer for final warm up Courtenay lost traction on an off camber and put the bike down on the drive side causing problems with the rear shifter. The rear derailleur was filled with mud as was the right shifter and this all needed to be cleaned as much as possible before we could even diagnose what the problem was. At first it seemed like the mud was the only problem but as we ran through the gears a few more times it became clear that there was a larger problem. To make a long story short, the shift cable had somehow pulled the shifting drum inside the shifter beyond where it’s limit was supposed to be and one of the small shifting paddles inside the shifter was caught and unable to hold the shifting drum in position. This was spotted by one of our other mechanics Otto approximately 10 minutes before the race was about to start. Luckily all this took to fix was one person holding the small paddle in the shifter up with a pic tool and another person pulling the cable from the derailleur end with the fourth hand brake tool. This rotated the drum back where is was supposed to be and the shifter was fine. So with no time to spare Courtenay heads out on this same bike to start as she liked the feel of the brakes better than the second bike. With Courtenay on her way to the start line, the rest of us hightail it to the pit which was very close to our team tent. We get our lane and get everything set up just as the field is sent off. We couldn’t see the field starting and had to wait until they are a little ways into the lap before we could pick them up and when we can I don’t see Courtenay anywhere in the group. She was the first call up and would normally be right at the front of this group this close to the start. As the group comes around and we get a good look at the rider’s position I see Courtenay about 15 seconds off the back of the pack all by herself and my stomach sinks as I’m sure the shifter has failed. So as the field comes past the pit for the first time I’m sure she is about to come in for a bike exchange but as they come by Courtenay stays out and races past the pit going as fast as conditions would allow. At this point I’m guessing that the shifter is not the problem and come to find out, as Courtenay tells me later, she had completely laid herself out in the first turn and got passed by the entire field. So with things a bit calmer now the race continues on and Courtenay is able to move up to about mid pack by the next trip through the pit. As she comes around on lap two though she immediately puts her hand up to signal for a bike exchange as soon as she come into view. She comes into the pit lane and relays to us that she has a rear flat as she escapes on the second bike and we start to swap out the bad wheel. It turns out that she had hit the rear on a stone step of some sort and put about a 5 mm gash in it. Now another of our mechanics, Brett was still in the pit with me at this point one of our other riders that he was supporting had to drop out of the race and he was still there to help us through the race. This came in very handy as one of us could Re-Stans the punctured tire to see if it would hold for another possible emergency while the other put the back up wheel on the bike that had just come in. We were able to have the bike washed, wheel swapped and ready to go and watching the other wheel by the time the field came around for the next pass. At this point Courtenay had started to build a lead (As you can immagine under these conditions most riders were having issues navigating the course and staying upright) and came through with about a 10 second gap. She continued to build on that gap for the remainder of the race until the final lap when she signaled for another bike exchange! This time it turned out to be nothing. As you can imagine in these conditions tire pressure is even lower than normal and the ground is very soft and soggy and can make you feel like you have a puncture sometimes. 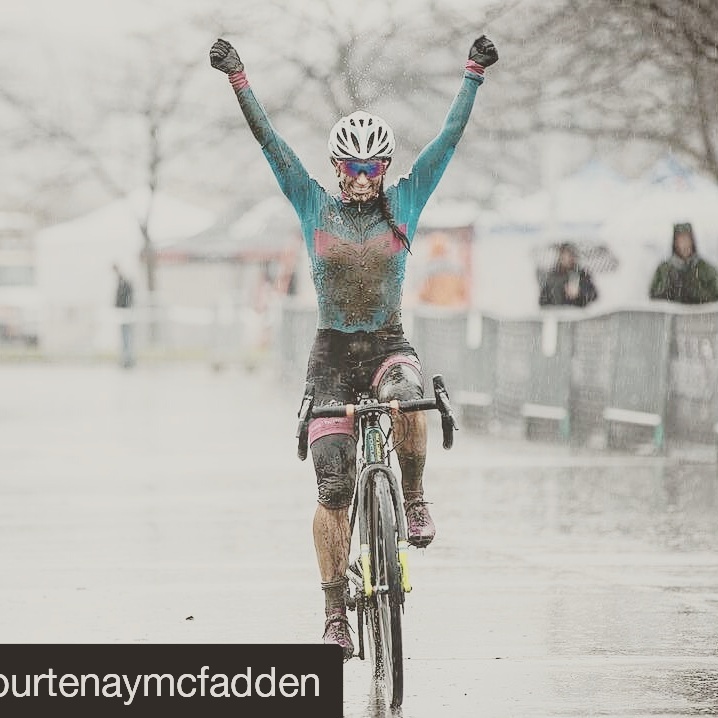 So to be safe with a lap and a half and a 30 second lead Courtenay was just playing it safe, getting a clean bike that she then took on to get her first UCI win of the season. This race was a lesson in teamwork! It took all of us working together to help Courtenay get this win and it makes it that much sweeter. 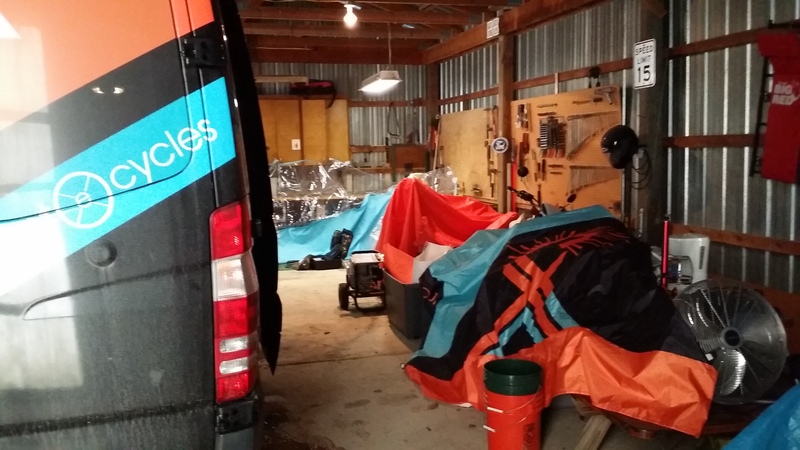 So this is the condition that the bikes are in when I receive them to get them ready for nationals. Both bike had been ridden very hard in wet and muddy conditions. 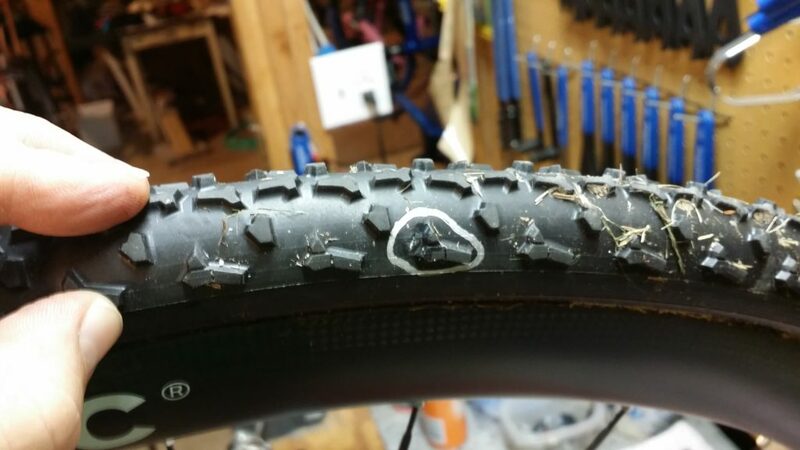 One of the bikes had hit the ground twice and one of the brand new tires had a bad puncture in it and would require replacing and possible even a cracked carbon rim. The first thing to do post race was to get the bikes at least in a good enough condition to travel home so that I can really get to work on them. This is just a basic spray off to get as much mud as possible off the bikes. 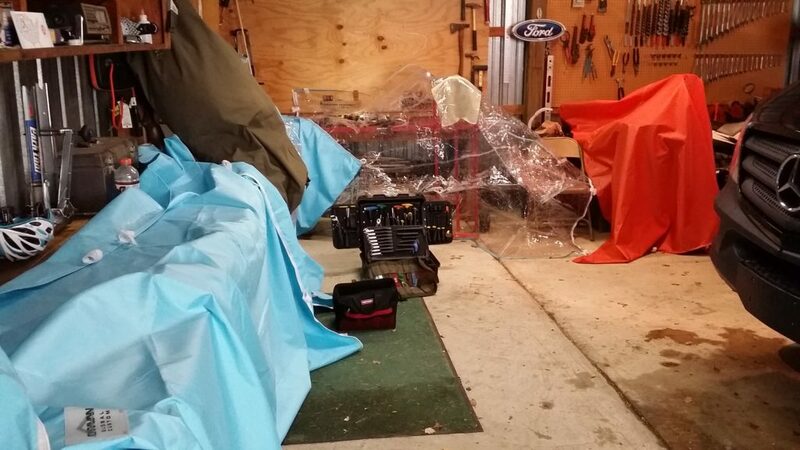 This will never be a perfect process because when you are in one of the last races of the day this time of year you are working in near dark; especially on a cloudy rainy day. Then a dry of the frames as much as possible. This is a quick process that just makes them able to travel. With a 5 hour drive home in the sprinter van my plan is usually to make sure everything is open to the air in the back of the van and able to continue to dry as I drive. So no wet wheels stuffed into bags etc. 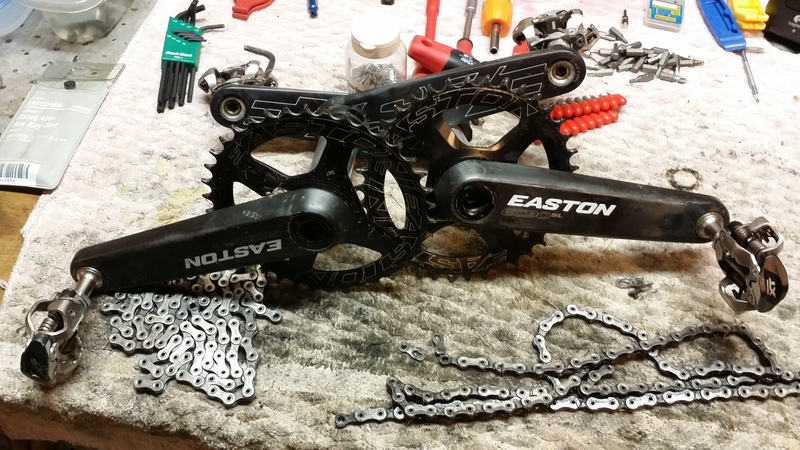 Finally I go over the bikes with some sort of lube on the chains, cassettes and derailleurs to make sure any moving parts are well oiled and won’t rust on the ride home. Now it’s Monday morning after race day and everything needs to be unpacked from the van and dried. Having a big barn really helps with this process!! Next get all the wheels down into the shop to make sure they are dry and all in good shape. This is just a preliminary check and they will all be looked at again much more closely before nationals. Then finally I get the bikes hung on repair stands to get ready to be overhauled. 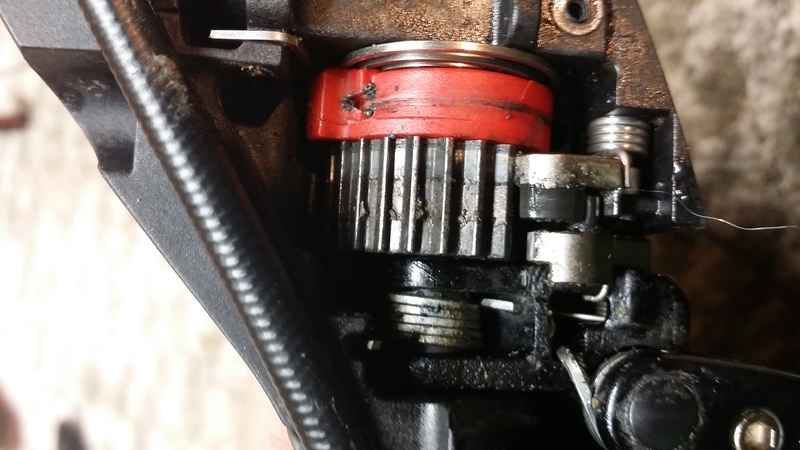 Both cranks are removed at this point to allow any water that might be inside the frames to drain and dry out as well as to check the BB bearings. 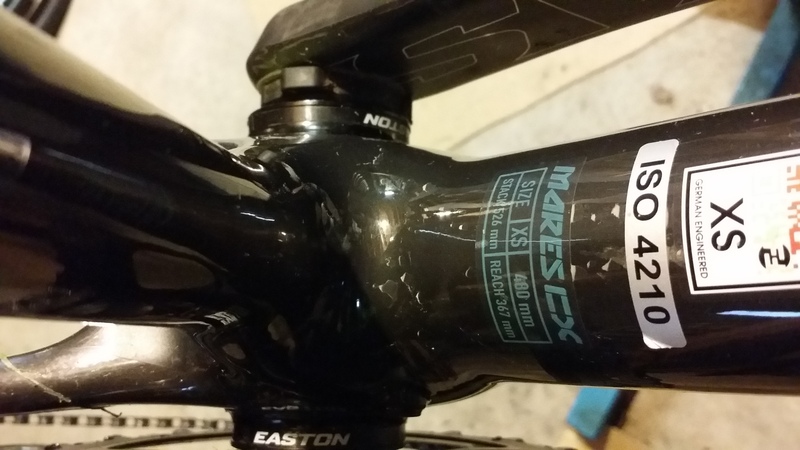 As you can see there is still small water spots and small spots of dirt dried on the frames, this is totally fine and will easily be cleaned off during the frame cleaning. At this point my post race day work on the bikes is typically done. The van is still a mess and needs to be cleaned out and the team tents will need to dry and all my tools will need to be gone through and checked so still plenty to do. That’s it for this installment of the mechanics corner. 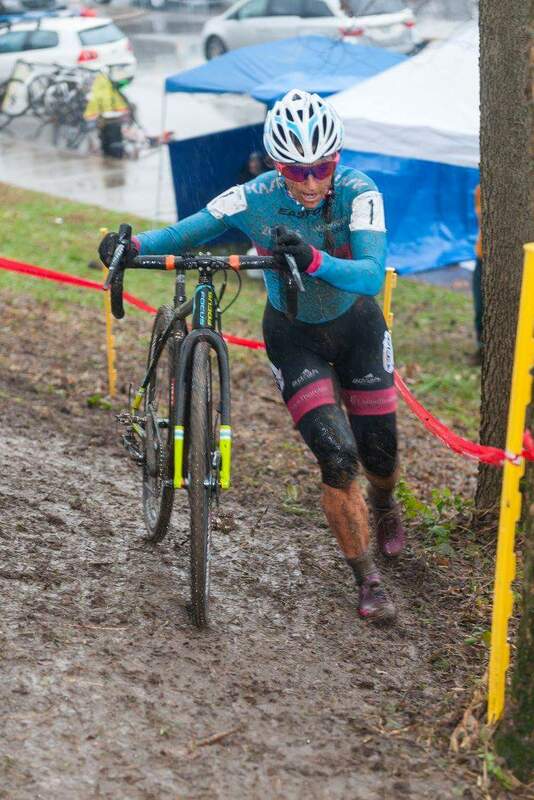 I’ll continue to do regular articles over the next few weeks as I get these bikes ready for Courtenay to race nationals so stay tuned and feel free to send any questions to me at cyclocrossnetwork@gmail.com Thanks for reading! Great stuff, Scott. When you work on the bikes post-race, do you remove the pedals from the cranks, as well? Scott, how do you transport rear wheels in the van? Can you post photo? Pedal removal just depends. I’ll look at the cranks and clean and lube the pedals soon. If there is any issue at all then yes absolutely they will get removed. I check them for tightness as part of every pre race check up and sometimes will loosen them and just re tighten them to make sure they aren’t stuck solid. Also depends on how much physical time I have. Turning around 2 bikes in a week can be difficult some times so if I’ve just checked them the week before I might just inspect them and check for tightness the following week. Regardless if they are removed or not I always inspect, clean and lube the pedal itself. This is great. Can’t wait for the next one!